I made the version with oat flour. These pancakes are a little more delicate than pancakes made with wheat flour so be careful when flipping. This was quite nice—perfect Chiffon Cake texture with a delicate flavor. Not beautiful, though, as the cake does collapse a bit. Hands down this is the best carrot cake I've ever tasted. It's really moist, has a perfect balance of spices, and just gets better the following day. The rice flour and a little oat flour provides complexity of flavour and a lovely, delicate crumb. I thought it was excellent without any icing at all or just a sprinkle of icing sugar. I made this based on the piglet review. This is a good carrot cake, although a bit sweeter than I prefer. I thought the cake was better on day two as it was less " Crumbly" and quite moist. I had some trouble with the icing. She heats cream cheese and butter in the microwave on low until they are soft and then mixes with powdered sugar and vanilla. My microwave only has one setting and the cream cheese mixed with butter initially had the texture of cottage cheese. It tasted fine, but the texture wasn't quite right. This is a very nice carrot cake, easy to make and unfussy. The blend of spices is just right. The texture is surprisingly soft, tender, and not greasy for carrot cake. The cake tends to crumble easily since there is no gluten and no xanthan gum. You will want to eat it on a plate with a fork. Alice Medrich says you can bake this cake in 9” layers, but I think it might break apart when removed from the pan. I baked it in a 9x13 glass dish. By the way, the recipe says bake at 350 for 30 minutes and reduce to 325 for an additional 30 minutes. My cake was finished 10 minutes after reducing the temperature. According to 2015 Piiglet competition, this is the best Carrot Cake that the judge who reviewed ever ate. I made it and really liked the cake, but I think I prefer the Huckleberry GF carrot cake. The frosting is outstanding. These had a nice flavour thanks to the oat flour, but apart from that everything went wrong. I don't have a stand mixer and used my food processor instead and that may be the root of the problems. However. the recipe says that the dough should be very stiff ... mine really wasn't despite weighing the ingredients carefully. The dough apparently can't be over beaten, so I kept going in the FP but the dough wasn't getting any stiffer and probably wasn't getting much air incorporated, so after about 6 minutes I gave up and tried to mould the dough into a log to refrigerate (difficult given its loose consistency). After two hours in the fridge the dough wasn't solid enough to cut, so I left it overnight. Not surprisingly these scones did not rise at all and were quite dense. Don't think I'll be trying these again! This was really delicious and received raves, though I would personally reduce or eliminate the nutmeg next time. The method of cooking the crumble topping separately kept it really crisp. I didn't have rice flour, so ended up using AP flour instead. I also changed the proportions to be half AP/half toasted oat flour, and I was satisfied with the result. The crumble was way too sweet. Cooking separately was a good idea--next time reduce the sugar. Also, I made and used brown butter--makes it nutty and delicious. Quite good. I found the crumble mix a little too sweet, but otherwise liked it. I added some seeds for some of the nuts (sunflower and pumpkin seeds), and liked the change. Would make again with a bit less sugar. Made these with coconut oil instead of butter. They were delicious, but the coconut oil gets very hard after being chilled. Next time I'll try dropping the dough on cookie sheets first. So delicious. This recipe will be used habitually. I used parchment despite the note - the edges of the cookies were wonderfully caramelly crunchy! Absolutely necessary to chill the dough for at least an hour. I used a mixture of pecans and almonds, no raisins. Oh my, I am embarrassed to say that I could have eaten all of these cookies! I made this recipe this month & loved them. They are VERY gingery but also very delicious ! I used crystalised ginger and it was fine. They turned out a little soft & chewy but that was OK too. Perfect ginger cookie! I halved the recipe as 50 cookies is just too much temptation. Easy to make as long as you chill the cookie dough for a few hours and delicious. A really wonderful cookie. I used these in my restaurant as a gluten free alternative dessert, but so many non-gluten-free people demanded them that they just became the default ginger cookie. And in fact my most popular cookie. Excellent texture, mouth feel and taste. But I found these cookies at least 10 to 15% too sweet for my taste. Has anyone else experienced this? I am anxious to try the buckwheat sables too and many more recipes from this intriguing book. And perhaps one of the variations listed for the oat sables. This is the third recipe I've tried in this book and so far I'm impressed. I made muffins here, which were quite savoury. Will be making these again and again. In place of raisins I threw in a quarter cup of each of chopped pecans and dried cranberries. We really loved the light, delicate texture of these muffins. 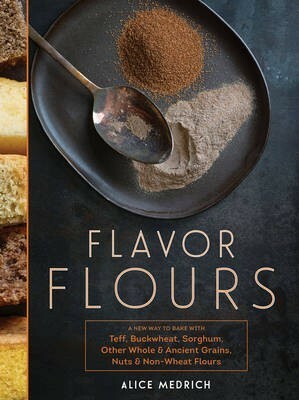 I'm excited to try more rice flour-buckwheat flour and other flour combinations in this book. The Carrot Cake from this book was featured in the Piglet Tournament as the reviewer's new go-to carrot cake, but my money is on this German Chocolate Cake. I really don't see how it could be better. Very similar to a cookie my Mum used to make. These are not very sweet which is a good thing in my book. These were just fine, but didn't wow us. I may try the variation which includes chopped chocolate in addition to the cocoa next time round. SO good! The coconut crust was a particular hit. It was a bit hard to cut, but tasted amazing! I topped it with whipped coconut cream and toasted coconut!